What type of mechanical key switch does the Razer BlackWidow Elite use? The Razer BlackWidow Elite uses tactile and click Razer mechanical key switches. Each of these mechanical switches has been sorted prior to manufacture, adhering to a strict design guideline. The keyboard also has a 80 million keystroke lifespan. The BlackWidow Elite is available in all 3 switch variants: Razer Green, Razer Orange, and Razer Yellow. You can learn more about our switches by visiting https://www.razer.com/razer-mechanical-switches. What are the new chroma lighting effect supported on the BlackWidow Elite and how do they work? The new quick effects are Ambient awareness, Audio Meter and Wheel. For Ambient Awareness, the lighting on the keyboard will reflect the averaged color on the selected screen region. For Audio meter, the keyboard will light up according to the audio level with a default spectrum of colors. For WHEEL, the keyboard lighting will rotate in the direction selected. I don’t see the 3 new profiles when I connect to Synapse 3.0. Why? These effects are coming soon via a Razer Synapse 3 update. How do I clean my Razer BlackWidow Elite? If you wish to clean under the key caps, Razer suggests holding the unit upside down and/or using compressed air from a can. We do not recommend removing the keycaps from your mechanical switches. The overall finish can be cleaned with wipes generally used for cleaning your computer monitor or sunglasses. Please ensure that the surface is free of large dust particles or debris before wiping the surface with any product. Wiping debris into the surface can lead to minor scratches on the surface of the unit. We suggest unplugging the device from your computer before cleaning. IMPORTANT NOTE: Under no circumstances should you ever submerge the keyboard in any type of liquid. Submerging the keyboard in any liquid will void the warranty on your keyboard. What are profiles and how many profiles can I save on the Razer BlackWidow Elite? Profiles are templates that are used to define a keyboard's settings for different games or applications. These customization options can be saved into profiles. This allows the user to fully customize the keys to suit each different game and application. The gamer could require different sets of macros, for example, for different games. The user can then conveniently switch between various saved profiles, saving the hassle of reprogramming the keys each time you launch a game. You can save up to a maximum of 5 profiles. Does the Razer BlackWidow Elite have anti-ghosting capability? How about N-key rollover? Yes, BlackWidow Elite supports 10 key roll-over anti-ghosting. N-key rollover (NKRO) only works with a direct connection to a native PS/2 port on the computer which provides for other limitations that USB overcomes. The Razer BlackWidow Elite’s gaming optimized key matrix serves a similar purpose while using an ordinary USB port. Will my Razer BlackWidow Elite work on a console (Xbox360, PS4, etc)? It has USB ports. Our PC USB products are meant for PC use only and we do not support using them on a Playstation 4 or Xbox 360 console. I cannot find my Razer mouse or keyboard in Windows Device Manager under "Mice and other pointing Devices". Can I program the "FN" key on my Razer BlackWidow Elite? What is on-the-fly macro recording? On-the-fly macro recording allows users to record lengthy macros in the game, without having to access driver menus or other software. For example, hitting the "Macro Record" key and then inputting a sequence of multiple spells in World of Warcraft saves this action to the specified key. The same sequence of spells can then be executed automatically with the actuation of that one button. How do I remove the key caps from my Razer BlackWidow Elite? Razer does not recommend removing keycaps from the Razer BlackWidow Elite. Several caps have springs that are very difficult to replace once the cap has been removed. Excessive force can also damage the key itself. If you desire to clean under the key caps, Razer suggests holding the unit upside down and/or using compressed air from a can. 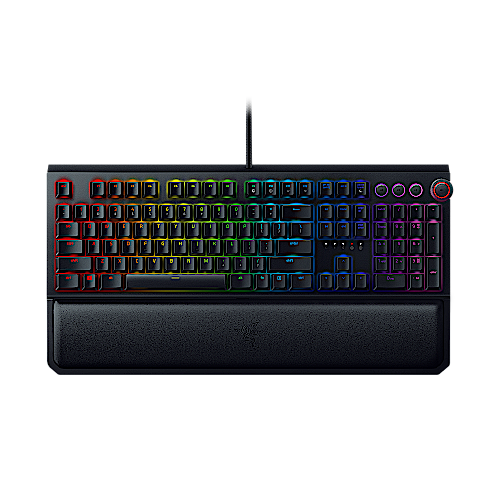 What are the switch variants available for the Razer BlackWidow Elite? The BlackWidow Elite is available in all 3 switch variants: Razer Green, Razer Orange, and Razer Yellow. You can learn more about our switches by visiting https://www.razer.com/razer-mechanical-switches.